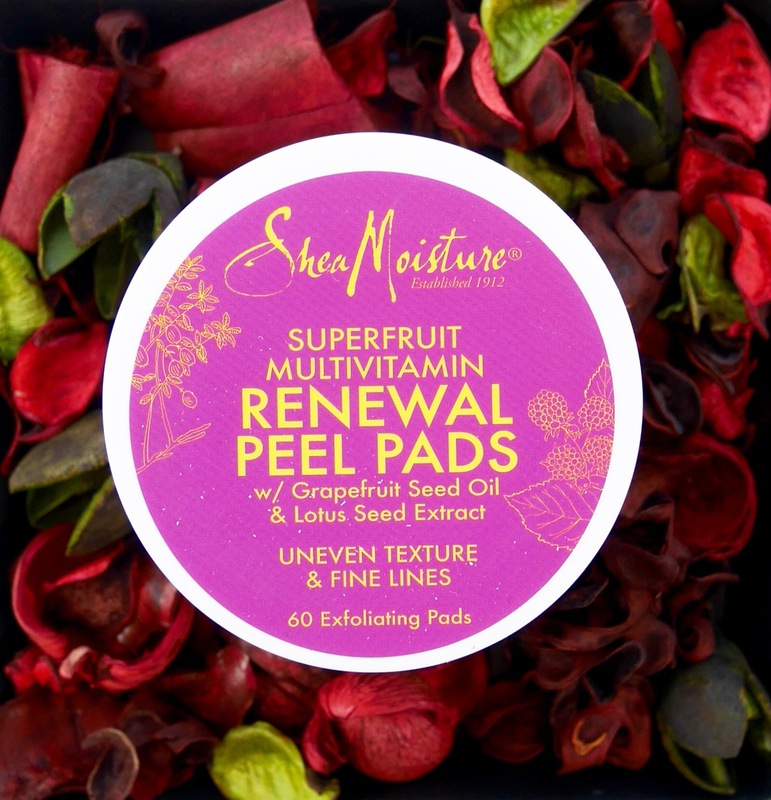 SheaMoisture’s SuperFruit Renewal Face Peel Pads are biodegradable, naturally-infused pads that gently retexturize skin to remove dead skin cells, revealing fresh, healthy, youthful-looking skin. Organic shea butter and mango butter blend with a proprietary antioxidant SuperFruit complex of red raspberry ketone, goji, acai and guava extracts to help soften and renew skin. Grapefruit seed oil and lotus seed extract combine to improve skin’s texture and tone. Aloe Barbadensis Leaf Juice, Water, Glycerin, Glycolic Acid, Sodium Hydroxide, Butyrospermum Parkii (Shea) Butter, Citrus Paradisi (Grapefruit) Seed Oil, Vaccinium Myrtillus Fruit Extract, Saccharum Officinarum (Sugar Cane) Extract, Acer Saccharum (Sugar Maple) Extract, Citrus Aurantium Dulcis (Orange) Fruit Extract, Citrus Limon (Lemon) Fruit Extract, Rubus Idaeus (Raspberry) Fruit Extract, Euterpe Oleracea (Acai) Fruit Extract, Lycium Barbarum (Goji) Fruit Extract, Psidium Guajava Fruit Extract, Avena Sativa (Oat) Bran Extract, Carica Papaya (Papaya) Fruit Extract, Pyrus Malus (Apple) Fruit Extract, Rosmarinus Officinalis (Rosemary) Leaf Extract, Oryza Sativa (Rice) Bran Extract, Helianthus Annuus (Sunflower) Extract, Shea Butter Polyglyceryl-6 Esters, Tocopherol, Maltodextrin, Niacinamide, Phytic Acid, Citric Acid, Caprylyl / Capryl Glucoside, Sodium Cocoyl Glutamate, Polyglyceryl-10 Myristate, Polyglyceryl-10 Decaoleate, Glyceryl Caprylate, Sodium Citrate, Sodium Benzoate, Potassium Sorbate, Gluconic Acid, Fragrance. Ingredient wise nothing jumps negatively at me. The reason they’re gentle is also clearly evident with first three ingredients being Aloe Leaf Juice, Water and Glycerin. Followed by Glycolic Acid and other fruit extracts. Its wonderful if you’re starting with acids or need a gentle morning acid tone. Except my only gripe remains with the pads themselves. Whilst they are soft they don’t seem to be well soaked and by the time I bring the pad down to my jaw and neck its dry! This is seriously my pet peeve with peel pads. The effects on skin are mildly noticeable on my acid addicted skin (I’m not the appropriate candidate to test this product), however someone who uses this product for the first time will notice a difference (so it has found a new home). It doesn’t dry out the skin at all, due to the wonderful addition of Aloe, Glycerin, Shea Butter (listed as 6th ingredient). I have not noticed any congestion with Shea Butter either. If you’d like something more punchier at same price point of $14.95, look into Nip+Fab Glycolic Fix Extreme with a base of Glycolic and blended with Salicylic, Lactic and Hyaluronic acid.